If you want to know how the southwest monsoon has been progressing this year over India, the best way is to visit the official web site of the India Meteorological Department (IMD) at www.imd.gov.in. and click on “Monsoon”. On the Monsoon page, you will find a variety of current and climatological information about the monsoon as well as forecasts. Another good site is Monsoon On Line hosted by the Indian Institute of Tropical Meteorology, Pune, on which you can see daily, weekly and seasonal rainfall statistics of the southwest monsoon rainfall over India. You can buy my latest book “Satellite Meteorology Second Edition” from Amazon. You may find a lot of helpful material. I represent a bunch of over-enthusiastic MBA students (from the States/Dubai) that are trying to understand the process of “making it rain” through “rain seeds”. I belive there was an article in the Times of India last year about how some brilliant minds from The Colaba Observatory came together and used “Rain seeds” to make it rain. (My details may be off so I apologize in advance.) Is that a topic on which you are knowledgeable and able to do a 30-minute chat session over skype? Or would you happen to know a Scientist/Meteorologist that knows about these “Rain seeds” and the conditions required to make it happen. Thanks for your comment. But I am sorry that I will not be able to join your chat session. I read some of your answers related to monsoon, its really impressive way to deliver the meteorological processes to society. Can you please educate me about the role of large scale change in cross-equatorial circulation on the monsoon? You have not revealed your name or background. That makes it difficult for me to respond. The cross-equatorial flow is the core feature of the southwest monsoon system. Any weakening of this flow will surely affect the southwest monsoon adversely. I have a doubt. Why there are no thunderstorms in monsoon rain, whereas there are thundershowers when the monsoon retreats? Where do you live and what do you do? If I know that, I can explain better. There are three basic conditions for the development of a thunderstorm: moisture, instability and a lifting mechanism. Air is considered unstable if it continues to rise when given an upward push. An unstable air mass is characterized by warm moist air near the surface and cold dry air aloft. As a rising parcel of air cools, some of the water vapour will condense, forming a cumulonimbus cloud that is commonly called the thunderstorm. For a thunderstorm to develop, what is needed is an initial trigger or a mechanism that will give a start to the process of upward motion. The temperature of the lowest layers of the atmosphere increases rapidly in the afternoon or evening because of land heating and the warmest air tends to rise. Terrain may also be a cause for lifting, as when air currents encounter a mountain barrier, they are forced to rise up the slope of the terrain. After the monsoon has set in, the above conditions are not met and so thunderstorms cannot form. Since you live in north India, you will notice that thunderstorms do, however, occur in the vicinity of the monsoon trough and during the monsoon breaks. In the monsoon withdrawal stage again, thunderstorms occur as you have yourself observed. Thank you very much sir, this clarifies my doubt. So are also Thundershowers in Monsoon breaks also included in Monsoon? I am very much interested in Metetorology. pl. guide me about the forecasting sysytem in India. If you are based in Pune, please visit the IMD office and ask what you want to know. Sir, i requested to have Your Views on this please. And they do not mention the effect on W.D.s ..i mean La-Nina effect on W.D.?? Thanks for your question but I do not have an off-the-shelf answer right now. And I would still recommend a Google Scholar search. Being a weather enthusiast, I would like your views on how a La-Nina event would effect India’s NE monsoon and flow of Western Disturbances in the North ? Many research papers about El Nino – northeast monsoon relationships have already been published. You can find them through Google scholar. A very good application of astrometeorolgoy was verified here at Kochi as the onday cricket tournament was postponed due to good rain. This was very well forecasted in a News Channel TCV here by me (as mercury moving from Kanya rasi to Thula and there a < 30degree angle with Venus) but the meteorologists here told that their forecast is 0 rainfall on that day and will not be any rain. So I once again remeber, astrometeorology is a very good applied science if we consider it in good sense. I stumbled upon your blog while trying to figure out what is going on with the monsoon. It is lamentable that India being primarily and agricultural economy depending on seasonal rains only does not have proper forecasting technology to anticipate the monsoon. I am not sure if you feel the same way or not but the simple fact that India only uses 2 satellites (INSAT 3A and Kalpana-1) for weather predictions compared to at least 9 for watching TV and military purposes. The last satellite launched for weather observation (INSAT 3A) was way back in 2003. Since then we have been only obsessed with reality shows on TV where we make little kids dance in scanty and provocative clothing. There are 9 satellites for terrestrial television transmission, the last satellite being INSAT 4CR which was launched in 2008 to replace the failed INSAT 4C. Coming back to the topic, at least for now I would like to know what do other developed countries do to predict seasonal changes and specially rains. As of now based on the satellite images available, I dont see enough of a build up to satisfy even the revised forecast the met department came up with regarding the monsoons (10th June to 20th June in peninsular India). Why doesnt India have a mature forecasting process for the most important seasonal event that drives such a huge portion of its GDP and provides employment to almost 70% of its population? You have raised some important and pertinent points in your comment. However, I would like to know what you do and what is your background. That will help me in framing my reply. Eventhough the IMD predictions were going wrong recently, the astrological predictions are ocurring 99% in Kerala. IMD forecasted onset of monsoon in Kerala from the first week of may to 31st may, but the same haven’t came upto this time. Tis is the situation when we bow before the astrological predictions as they can tell long range weather forecast years ago. According to astrometeorology they predicted very good rain during 9th june to 6th july in Kerala and the onset will start from 6th june. When I told this to meteorological dept they said it is impossible and the onset will come in the middle of may etc. And now they say elnino effect etc. what is the actual problem? Why they cannot predict theese effects earlier? By a mere statistical analysis shows the predictions made by IMD is very poor for the last few years. Meteorology and astrology use different data inputs and different methods of analysis. Their domains are also different. Meteorology deals only with weather and climate, while astrology deals with almost everything under the sun. Astrological predictions cover personal finance, business matters, matrimonial alliances, political events, disasters, human longevity, health, success in examinations… the list is endless! For those who believe in astrology, I would say, go ahead, let the planets rule your life!! As for me, my God is not governed by the universe because he has made it, and I prefer to deal with him directly. I shall give below the points in one of my research articles with Dr.G..L.H.V.Prasada Rao of Kerala Agricultural University. Please go through it and comment. It is not astrology but we are developing one science. Oh your predictions are perfectly correct. Very good rain in Kerala. Will it last up to July 6? Already filled with water every where. Great!. Is it true science? How planets can influence on earth? Is there any unknown forces acting behind it? I can’t believe the accuracy in prediction. But actually that’s happenning. There may be some techniques in ancient India for knowing the influences. is n’t it? Surely Ancient Indian’s are great scholar’s otherwise how they made the great science Ayurveda when not such population to test is n’t it. Surely there may some techniques behind these great sciences discoveries. That is yet to be proven whether it is true science or not but can’t disagree the results while comparing with our true science. Experience is the best teacher. According to current movements when will monsoon reach pune. Thanks for your query. I suggest that you keep visiting the IMD web site regularly and see the Daily Monsoon Report. That will keep you apprised of the progress of the monsoon. Because it comes within the rain shadow area. Now I know why you are what you are. Your Blog was an inspiration to me. I hope I will be able to put in more consorted efforts to realize my dream. Right now I am Enjoying the fall season in full swing. It can only be some one out of this world who can perform this miracle. I am planning to be back in India by the end of Nov09. Istart my acivity as an observer at the SERC school on aviation met. at AFAC, Coimbatore. I must thank you for visiting my blog. I retired from the India Meteorological Department in 2003, and I am no longer engaged in active research nor do I have operational data. I am therefore not quite in a position to provide the explanation that you have sought. First of all, thanks for clearing my queries. Sir, as of now IMD has forecasted that s-w monsoon has covered the most of India i.e. 95% in exact by July 1st but the thing that is the real concern is the formation of low pressure over the Bay of Bengal which strengthens the inward flow of monsoon winds towards Delhi, Punjab, Haryana, U.P. etc. which is still absent. So, what could be the outlook for the rains in these areas since they are the food production house of the country? And, what could be the reasons which are preventing the formation of low over Bay of Bengal? When I was in USA we could get regular weather update on weather.com channel. Its infact a 24/7 weather channel. They used to provide live update on climate and weather. Is the Indian government also planning any such weather channel. Moreover the same weather channel makes available the same data on their super sophiticated website http://www.weather.com. One can obtain data for Indian cities as well by just quering for the city on search tool. Unlike Indian website “http://www.imd.gov.in”, they show the density of the cloud mass. The densities are shown in different colours. If our domestic website can provide similar data it would be great. As of now I have no choice but to see the satellite image on weather.com and get a more accurate information. Sir, One can even download google earth and activate the weather data. It provides live data at a 6 hour interval. Please let me know whether our Indian website is likely to make itself as sophisticated as http://www.weather.com. Its vijayanand here. The rainfall over coastal karnataka has been very poor this year. Infact we have clocked just 39cms in june this year as against the average of 90 cms. Normally I browse http://www.weather.com to get accurate picture of clouds on Indian coast. The dense cloud mass is predominantly stationed to the west of karnataka coastline. Not sure why it isn’t moving east on to mangalore to karwar coastline. Is it because of the low pressure trough running parallel to the coastline and not getting closer enough. One more thing I have observed is the total absence of strong sustained winds from west. I just want to say that after reaching Kerala on 23 May, s-w monsoon got really slow and till now its unpredictable that when will it reach Mumbai? The only thing that I can relate to it is the blowing north westerlies and westerlies which are resisting the inward flow of south westerlies but is this also showing the impact of changing weather pattern as because this year it has been a severely wet summer for europe till now, so, could it cause an impact on the monsoons in india? And, if the answer is yes then what kind of weather we may expect in the upcoming years? What you say about this year’s monsoon onset is quite right. It has been a rather erratic onset. First the monsoon arrived over Kerala about 9 days ahead of its normal date of 1 June. Then there was a tropical cyclone Aila that went northwards all the way to West Bengal, disturbing the monsoon flow. After that the equatorial trough over the southern hemisphere became active and remained so for a long time. Now the entire monsoon flow seems to have weakened. What I would like to clarify is that the onset of the monsoon over Kerala is a global circulation event and so it can be predicted. This year an early onset was in fact predicted. But the arrival of the first monsoon rains over the interior parts of India is governed more by local factors and therefore more difficult to predict. Before we rush to a conclusion that the weather patterns have changed, it is necessary to consider the fact that the monsoon has a high interannual and intraseasonal variability. A variety of scenarios are possible and every year’s monsoon is different from others in one way or another. The s-w monsoon covers India sometimes quickly but sometimes slowly. The normal date of its arrival over extreme west Rajasthan is 15 July. So we have to wait and watch its progress this year. By the way, I have written a book on the subject of monsoon prediction, the details of which are available elsewhere on this blog. If you are really interested, you can get a copy for yourself. If there is anything more you want to ask, feel free to do so. Could you tell me where I can get right prediction abt monsoon in Rajasthan? how much would be the rainfall and approx weeks ?? I am running a wooden furniture export business and one big order is on the way. I need to have all this details cox monsoon gonna play a major role in my production. I hope you will satisfy my query. Please visit the IMD web site http://www.imd.gov.in regularly and you will get updates on the progress of the monsoon. The monsoon has just entered Kerala. Rajasthan is the last point of its northward journey and it takes about 5-6 weeks to complete it. From Last two months the Maxm Temp is incresaed,can you say that the this year we get normal monsoon,because our farmer is well depend on monsoon. Thank you for your interest in my blog. Let me clarify that the India Meteorological Department gives its long range forecast for the country’s average rainfall and not for individual states or districts. 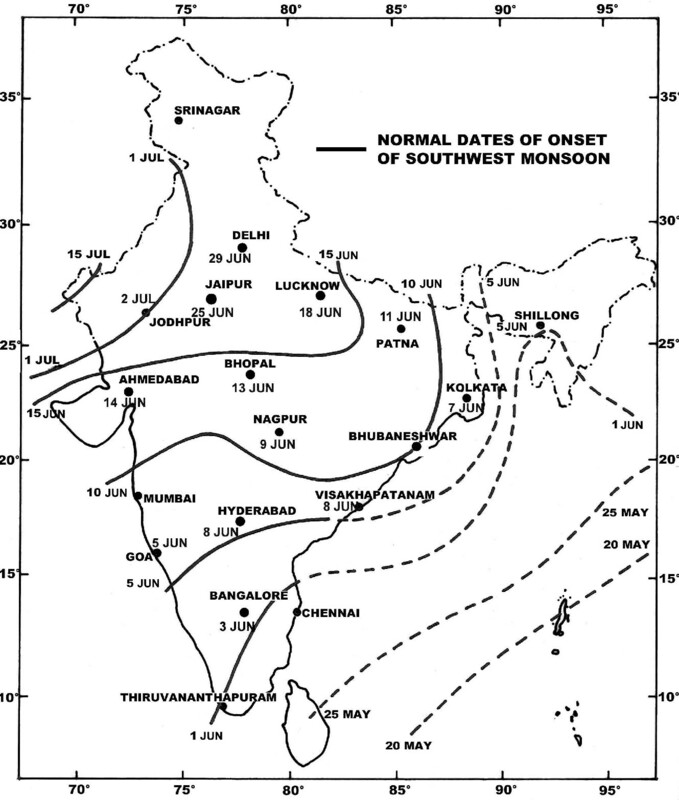 The long range forecast for the 2009 monsoon is available at the IMD web site http://imd.gov.in/. It describes how the forecast is arrived at and what factors are important for the monsoon. This site is the best source of information for the day-to-day progress of the monsoon and I recommend that you should visit the IMD web site at least once a day. There is another IMD web site http://www.imdagrimet.org/ where you can find a lot of information on the weather from the point of view of farmers. If there is a likely break in the monsoon, this web site will tell the farmers what they can do in that situation. These “agro-met” advisories are given on the web site for every individual state and even every district. They are written in the local languages, like Marathi for Maharashtra state, so that farmers can easily understand. I suggest that you also visit this site regularly and make use of the advisories that are given specially keeping the farmers’ requirements and problems in view. I feel that you will find useful information in these two web sites and I recommend that you make a habit of seeing them daily throughtout the monsoon season. Most predictions are for a normal monsoon this year. But please keep in mind that a normal monsoon for the country as a whole does not mean that it will be raining equitably everywhere and all times. Even in years of excellent rains, there are some pockets of deficient rainfall and there are dry spells in between wet spells. Will it be a normal monsoon for our farmers . Deep in debt and desolate farmers need Varuna Grace to pull it off this year. I pray to Lord SAI to bless with normal rain for these farmers. IMD Mumbai has its own web site at http://www.imdmumbai.gov.in on which you can get more detailed information about the weather over Mumbai city and the states of Maharashtra and Gujarat. You may send your specific query about the onset by email to ddgm@imdmumbai.gov.in. Why IMD again fail to predict the onset of monsoon over Mumbai? Just two days prior to onset i.e. 7th june, IMD declared that onset of monsoon over mumbai will be not before 12th June ( sahaydri news channel ) Which are the parameters one must study for decalring onset of monsoon over a region? Thanks for your comments. You will appreciate that Cloud and Sunshine is just a blog and not a site that accepts articles. But there are other online magazines like ‘earthscienceindia’ where you can try to submit them. can we send articles in Meteorology. pls can you confirm.